EDUCATION BA in Elementary Education at SUNY at Fredonia. 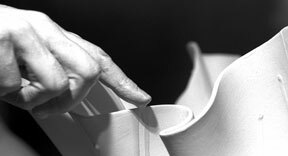 My work in clay has been guided, not by a formal degree program, but through participation in scores of workshops across the country, a strong self-assigned reading program and through many hours of happy experimentation. My work has been shown in over 100 shops and galleries across the U.S.-- in 32 states, and as far away as Hawaii. In the Rochester region, you can find my work at the Memorial Art Gallery Store. 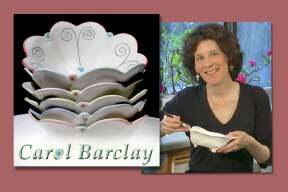 In addition my work is available on-line at CarolBarclay.etsy.com and at ArtfulHome.com. My pieces are part of many public and private collections, including the Corning Glass Center, and have been published in numerous publications. I have given lectures and demonstrations in many situations across the state, and am committed to sharing my passion for and knowledge of clay with all who are interested. I work out of a large bright studio in my home, overlooking my other creative passion -- my garden.